Free Europe Bus Travel (Yes Free!) with Hello Bus! | No Mas Coach! Home » First Class Travel Blog » Free Europe Bus Travel (Yes Free!) with Hello Bus! Free Europe Bus Travel (Yes Free!) with Hello Bus! European bus company Hello (Hellö) is running one heck of a sale, and if you haven’t heard of them, you should definitely check them out. Hellö is an offshoot of ÖBB, the Austrian Federal Railways, and just started selling tickets not too long ago. In celebration of their success, they’re running an awesome sale where you can get €10 off of your travel inside of Europe. With there extensive route network, this could be a phenomenal way for you to travel all over Europe for next to nothing, or perhaps even free! You can go to a lot of cities in Germany, Croatia, Italy, Austria, Switzerland, Slovenia, EVEN France. The hello buses are quite modern and comfortable, with Wifi, Comfy seats, restrooms, power ports, snack vending machines, the works. The ticket comes with a luggage allowance too, so don’t worry about paying those ridiculous airline surcharges. According to my tests, it looks like you can use it multiple times, so if you break your trip up into two or three segments, in theory, you could be traveling, FOR FREE 🙂 Or pretty damn close to it, worst case scenario you’ll spend a couple of Euro. All you’ve got to do it go through the booking process, and right at the end with the box for the Promo Code enter BUSGURU and they’ll take 10 euros off the booking. 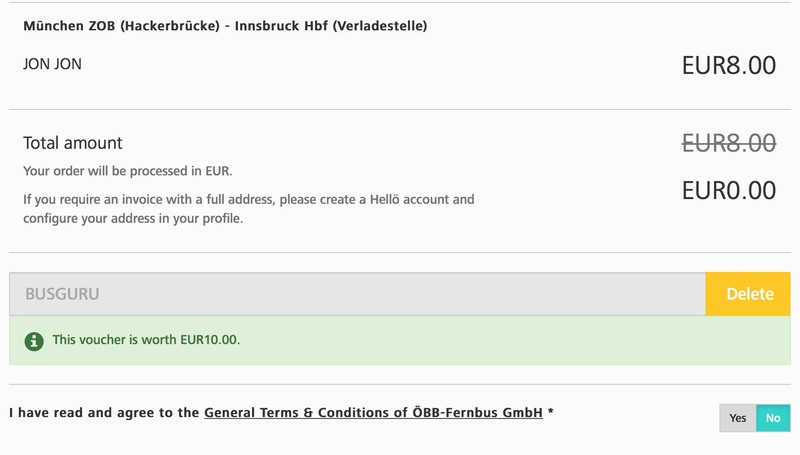 Here’s an example of a $0 FREE trip from Munich to Innsbruck. I don’t know about you, but Free is Free, and a Free ride from Munich to Innsbruck on a climate controlled, wifi enabled, toilet equipped bus seems like a no brainer to me! Check out www.helloe.com to book your seat! So, if you’re planning a trip in Europe, or you live there and have used the Hellö bus service, let us know below! This is great. I have never heard of them before but will be checking them out for future trips. Not quite first class with champagne though is it lol?! CHECK AGAIN, I just tried it and it works perfectly. Make sure to use capital letters!